Ok, so the other day when I was making those yummy Rosemary Sesame Almond Crackers, one of the many tries included a version that was full of starch. The darn things just didn’t hold together, they crumbled pathetically. I was a bit discouraged, but froze the crumbs just in case I could do something cool with them. And lo and behold… I had some ground turkey and thought… hey… I bet those crumbs would make AWESOME meatballs…. What I didn’t realize, was that starch is much more absorbant than GF flours… So I accidentally discovered that it works incredibly well helping to bind meat. Even better, it prevents meat from sticking to the pan! Will wonders never cease. I had no idea. Now, look. Normally, I don’t really like ground turkey. I do anything I can to mask it- its kinda dry and insipid. 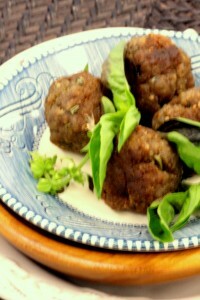 When these meatballs came together they were so tasty I think I kinda surprised myself :) The sunflower seed butter adds fat, and the rosemary and sesame add a super flavour. The flours add structure and really improve the texture. Overall, in fact, you’d never actually know you are eating ground turkey. Kinda like my Turkey Bolognese sauce! Note: If you just want to make regular meatballs with this recipe- sub the turkey for 1/3 part ground veal, 1/3 part ground pork and 1/3 part ground beef, and take out the rosemary and sesame seeds! Put all the ingredients in a bowl, except the olive oil. Squeeze it around with your fingers, mash it around. You need to incorporate all the ingredients as thoroughly as possible. Once everything is evenly mixed together, you’ll notice that the mix holds together like a ball and isn’t sticky. Pull out a clump a bit larger than a golfball. Roll it in your hands until it stays together- this is your meatball. Place on a separate plate and continue until you’ve finished the meat mixture. In a large frying or sauce pan, put the olive oil. On medium to low heat, cook the meatballs uncovered. When they are brown on one side, turn them over. When all the sides have been browned, open one to check that the inside is cooked. It should be done. You’ll notice that the outside is crispy, because of the starch. Really interesting on the starch, I will have to give it a go! 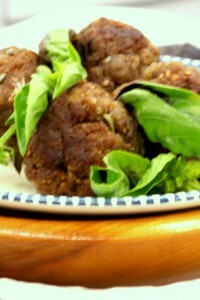 mmmmm… I have a strange weakness for meatballs and these sound super yummy!